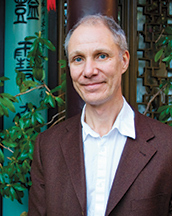 Dr. Heiner Fruehauf has researched East Asian civilizations and Chinese medicine for more than 30 years. After studying comparative literature, philosophy, sinology, and Chinese medicine at universities in Germany, China, Japan and the United States, he received a PhD from the Department of East Asian Languages and Civilizations at the University of Chicago. During five years in China, he researched Chinese medicine both within the institutionalized TCM model (Chengdu University of TCM), as well as the traditional lineage system that continues to function outside government schools. Dr. Fruehauf is the founding professor of the College of Classical Chinese Medicine at NUNM, where he has taught since 1992. He also has an active private practice in the Columbia River Gorge area, specializing in the treatment and prevention of chronic, difficult and recalcitrant diseases with Chinese herbs. His interest in preserving some of the traditional features of Chinese medicine led him to develop a database dedicated to the archiving of classical knowledge, and an herbal patent series for chronic and difficult diseases. A selection of his publications, as well as archived video lectures by him and other contemporary scholar physicians can be accessed at www.ClassicalChineseMedicine.org.